Anyone who has read this blog regularly for the past few years know that I have often been very vocal about many of the changes Facebook has made to their site. In the case of many of these changes it has often seemed to me that Facebook was determined to reduce the over all usability of the site. This was particularly true of Timeline, the new user interface for user and page profiles. From the hype Facebook seemed convinced that Timeline was some sort of quantum leap in social network user profiles. On the other hand, most users I know hated Timeline. They thought its double column layout was not only unattractive, but made it hard to read anyone's profile, even one's own. While complaints about Facebook would decline after the social network forced everyone to change to the Timeline layout, the hatred for it has never truly gone away. Most users I know simply tolerate because they feel complaining will do no good. Fortunately, it appears that Facebook realised that users hated the double column layout of Timeline and started taking measures to correct it. 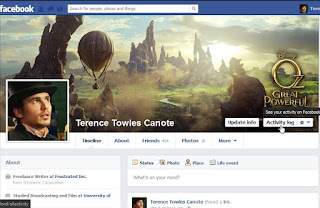 Earlier this year Facebook began testing a single column version of Timeline. Fortunately, I was among the users who received this new Timeline layout and I must say that I liked it much better than the original, double column version of Timeline. Not only was it more attractive, but more importantly it was easier to read. It was just last week that Facebook rolled out a new version of the single column Timeline. If anything, this version is even more of an improvement. Below are a few screen shots. As you can see on one's posts are on the right, while on the left are a series of boxes. The boxes on my profile are About (a bit of information about myself), Friends, Photos, and Likes (various Facebook pages I like). To some degree one has control over which boxes appear in the right sidebar of one's profile. While one cannot remove the About, Friends, or Photos boxes, he or she could set them to where they could be seen by himself or herself. In addition, one can add boxes for Places (places one has lived or visited), Music, Films, TV Programmes, Books, Notes, and so on. Above one's boxes and posts, but below the cover photo, one will see a horizontal menu that includes "Timeline," "About," "Friends," "Photos," and "More (which provides a drop down menu including "Likes" and "Notes." This much more compact than the original double column Timeline or even the original single column Timeline, which had little boxes for each category. My first impression of the new, single column Timeline is that it is much easier on the eyes than the original version of the single column Timline and especially the original, double column Timeline (which I think could quite accurately be described as an "eyesore"). It is fairly easy to use. In fact, I would say it set up much more intuitively than the original, double column Timeline. And I must say I like that Facebook is giving users a degree of customisation, something that has been lacking on the site for some time. Personally I would like to be able to be given the ability to hide all of the boxes (there does seem to be a bit of redundancy in having both a link to one's Photos and a box for one's Photos), but the fact that I can add boxes is real progress for Facebook. Over all, then, I must say that I actually like the new version of the single column Timeline, not something I've been able to say about a change Facebook has made in quite some time. Of course, this is not to say that Facebook has saved itself in my eyes. Facebook has made far too many missteps over the years for me to think that they are turning themselves around from a company that doesn't listen to its users to one that does. Indeed, they are supposed to be releasing a new version of the News Feed quite shortly and I worry how they may have changed it. Regardless, this new single column Timeline is definitely a step in the right direction.